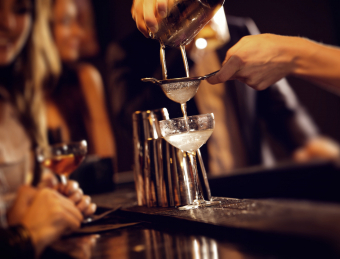 Tend your home bar like a pro with this easy tutorial on how to mix a cocktail. These tips, tricks, tools and techniques will leave your thirst quenched. There’s something to be said about the ease of wine and beer: open bottle or can, pour into glass and drink. Fussy oenophiles decant at will, but for the rest of us that sums up how it’s done. Yet someone who knows how to mix a cocktail does have a certain charm, no? For the physically uncoordinated, however, this can seem like a major spill and permanent stain waiting to happen. All the shiny gadgets required to serve the James Bonds in our lives could also leave us wanting to drown our sorrows for all the money we’d spend wetting their whistles. But you really can mix a cocktail like a pro without turning your bar table into an advertisement for Williams-Sonoma. A one- and two- ounce jigger will make home bartender life easy. If yours doesn’t have measurement markers, fill to the widest point to get the right volume. Not only will this help you channel your inner Tom Cruise à la Cocktail, you’ll be able to blend drink ingredients together while chilling them at the same time. Shaking aerates your concoction, which changes its consistency and mouth feel. Tin-on-tin shakers are the choice of bartenders because they’re lighter and won’t break. You also won’t lose the cap — a possibility with a cobbler shaker, which renders it useless. Shakers are comprised of one 18-ounce tin and a 28-ouncer that fit together to create a seal when shaking. It’s a metal teaspoon with an elongated handle that makes it easy to stir drinks in tall glasses. If you have something vaguely resembling such a gadget in a kitchen drawer somewhere, save your money and use that instead. A mixing glass equipped with a spout for pouring stirred cocktails into a drinking glass may be a worthy investment if you don’t intend to join Team 007. Otherwise, just stir in the glass from which you’ll be sipping your handiwork later. This keeps mixing ice, fruit, herbs and anything else solid that was in your shaker from winding up in your glass. Use a Hawthorne strainer. It’s the one with a metal coil to help it fit snugly in the tin of your shaker. It’s also the most versatile strainer. Otherwise, a small, cone-shaped, fine-mesh sieve works in a pinch. Unless you’ll be drinking martinis, buy some highball glasses, which are perfect for longer drinks topped with soda. And don’t forget a few rocks glasses, the highball’s short, stocky cousin meant for the Old Fashioned and other cocktails or spirits served over ice. Whatever vessel you use, chill it in the freezer before pouring a drink into it. Sticking it in a snow bank will work, too. Ditto for filling it with ice and cold water while mixing your bevvy. Add all the ingredients to the small tin of your shaker. Put the large tin on top, tapping gently to form a seal. Invert and always keep the larger tin on the bottom. Place your hand over the seam, with two fingers on either side of it. Place your other hand on the bottom of the shaker for more support. Shake hard and short for about 20 seconds, with the shaker in front of you or next to your ear. Gently tap the seam with with your palm to unhinge the tins, grab your strainer and chilled glass, and pour. Garnishes are optional, though depending whom you ask, a citrus twist isn’t, particularly if the fruit is in the cocktail.